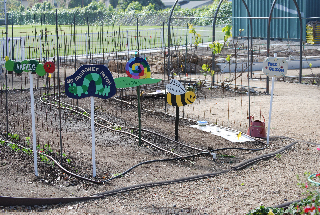 The beds are staggered so that if one is infested with bugs they don’t jump to the next planter. 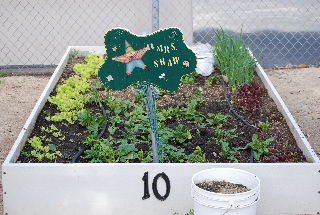 Another way we ward off pests is by placing the onion bed is in between the lettuce beds. A few weeks ago the third-grade class brought home their chives in a cup. So we thought we’d include a chive recipe for you to try. Directions In a food processor with knife blade attached, pulse cream cheese, sour cream, milk, tomatoes, chives, salt, and black pepper until almost smooth. Serve with sliced fresh vegetables or baked potato chips.